Stock market gored by a sharp spike in yields. Rising inflationary expectations feed into the fear of an aggressive monetary policy beyond current expectation. A cyclical adjustment as we enter the normal ebb-and-flow of stock market rises instead of just uninterrupted rallies. Stocks have wilted, but will not wither as economic expansion and earnings provide sufficient support. Many opportunities exist, and stocks will be positioned for further gains once the consolidation runs its course. The market decline in early February was one of the sharpest correction - a 10% decline - since the 1950s. Compressed in a week, the correction was a grim reminder that markets do pull back. All key indexes, the Nasdaq (QQQ), S&P 500 (SPY), Dow Jones (DIA) and Russell 2000 (IWM) had double-digit declines at their lows. Spiking concerns of rising inflationary pressures and rising yields triggered the decline, and the built-up pressure of low volatility and high correlation between asset classes contributed to its sharpness. The yield on the 10-year bond has climbed steadily towards 3%. The increase became more pronounced in the closing days of January. In the Market Outlook article a few weeks ago, which discussed the various factors putting pressure on yields, we had mentioned Interest Rates as one of the three key stock market supports, which has the highest chance of springing a negative surprise. But it was more of a second-half concern. What do we expect going forward? The markets will rise to new highs. The uptrend remains firmly in place, but the rallies will be punctuated with typical pullbacks as the market reverts to a more normal cycle. Gains are not over yet. 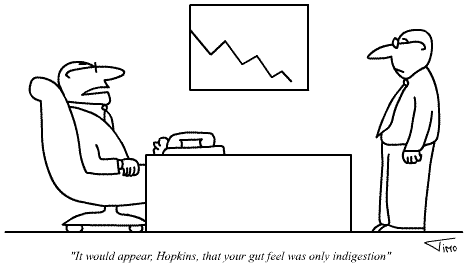 There is merit to inflationary concerns. The economy has been stepping-up its growth rate over the past two quarters, while not showing much wage growth last year. The January employment report changed that, with wages growing 2.9%, the largest annual increase since 2009. The sharp jump created the fear of persistently strong wage growth which may spark rapidly-rising inflation. Besides economic growth, bond yields are also being pushed upwards due to the rise in the federal debt borrowing to compensate for the revenue declines from the $1.5 trillion tax cut and the recent budget spending deal which is adding $300 billion to the future federal deficits. Furthermore, fiscal stimulation, due to the deep tax cuts, higher fiscal spending, and potential infrastructure spending to come, can contribute towards provoking inflationary pressures in a relatively strong, 2-2.5% GDP growth, economy. If the economic growth climbs towards 3% and higher in 2018, it will naturally release supply-constrained inflationary pressures. What we believe has the potential to constrain such supply-related price pressures can be an investment surge triggered by tax policy clarity and a clarion call by the administration for corporates to use the tax cuts to increase business spending. A surge here is relative and would mean a return to the average business investment patterns of prior expansions from the depressed levels of the current expansion. 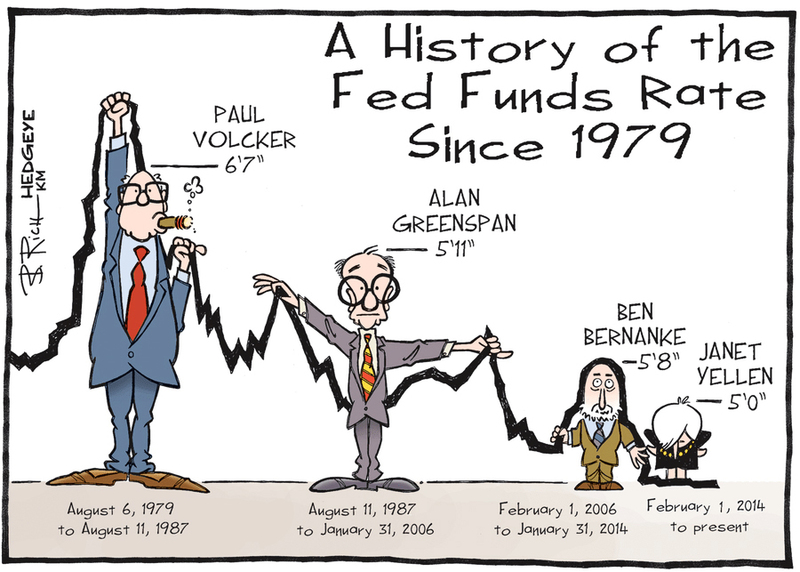 All the above contribute towards the Federal Reserve's task of keeping interest rates on the optimal path much more challenging in 2018, as it continues to decipher the impact of full employment, longevity of the recent jump in wage growth, and rising commodity prices, amongst many other key economic variables. The serene interest rate environment over the past decade has been firmly based on low inflation expectations. It is an economic mindset which permeates the psyche of both consumers and businesses. Unhinged or sharply rising inflationary expectations are inimical to economic growth and corporate profits. Expected and incremental inflation can be managed by cost efficiencies and small pass-throughs to consumers. In contrast, sharply rising persistent inflation hurts corporate margins due to limited pass-through of higher costs to consumers and a change in demand behavior as consumers reduce consumption due to higher prices. An unhinged inflationary expectation is definitely not the backdrop that can be visualized today. The data is not there yet, and it remains dynamic. In other words, one or two months of data points will not be sufficient to establish a trend, and the narrative of higher inflation has to look at a persistent inflationary pattern over a comprehensive set of indicators. The key is for the rates to rise gradually in the normal course of an economic expansion. The 10-year yield is a good barometer to judge market sentiment on inflation and economic growth. The yield has risen sharply from 2.25% to almost 3% in 2018, as shown in the opening chart. Another move now to 4% or higher during the year can be considered a sharp rise and may cause higher volatility and a pullback in the stock market similar to what has been experienced in February. This is not the expected scenario at this point. Monetary policy is still accommodative to neutral in terms of real interest rates (Fed Funds less core PCE) which are a little negative to approaching zero. The negative real rates contributed towards a market multiple expansion since 2015 as it has been attractive to invest in stocks than fixed income. As bond yields rise, the relative valuation of fixed income investments becomes attractive compared to the earnings yield of stocks. 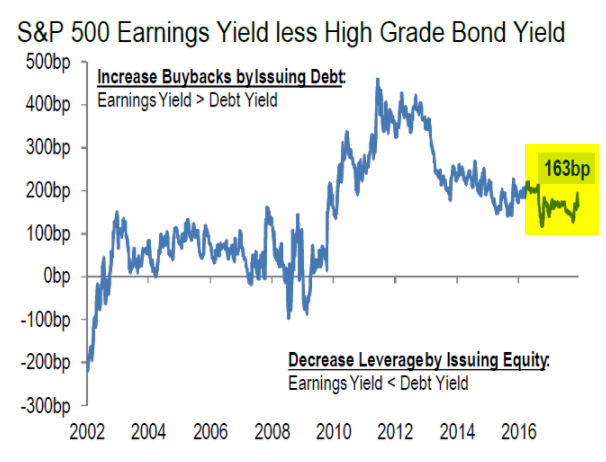 At this time the earnings yield is meaningfully higher than AAA bond yields, providing support to the argument for favoring an equity allocation. Typically, it's the over-tightening to fight inflation expectations that nudges the economy into a retreat and a Fed-induced recession. The central bank's success in maintaining an appropriate balance to serve its dual objective of high employment and price stability can continue to prolong the expansion. The Federal Reserve has thus far shown strategic patience in administering monetary policy for the last many years, and we believe this still remains the soundest argument for a continued prolonged expansion even under the central bank's new leadership. A rising yield is a normal phenomenon in a strong economy. Investors are now encountering a resetting of expectations where the yields are rising to reflect a strong economy that has also received a dose of fiscal stimulation. Such a resetting process itself is volatility prone, as has been witnessed thus far. After the sharp correction, it is important to recognize that the atypical scenario of a) record-low volatility, b) prolonged negative real rates in an economic expansion, and c) one-way market movements, all experienced during 2017, is now transforming into a more normal business cycle scenario. 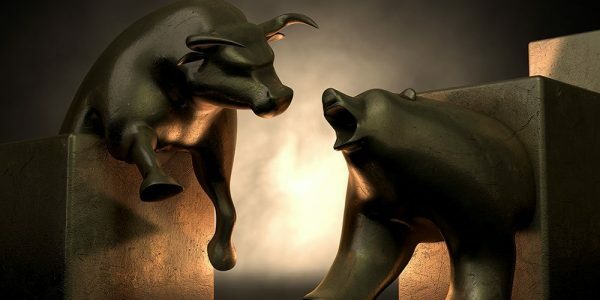 The economic scenario that the stock market will negotiate post-correction is one of stronger economic growth accompanied by continuing earnings growth and steadily, but not sharply, rising inflation and interest rates. This is not a bad scenario for stocks and can be even considered the Goldilocks version 2. 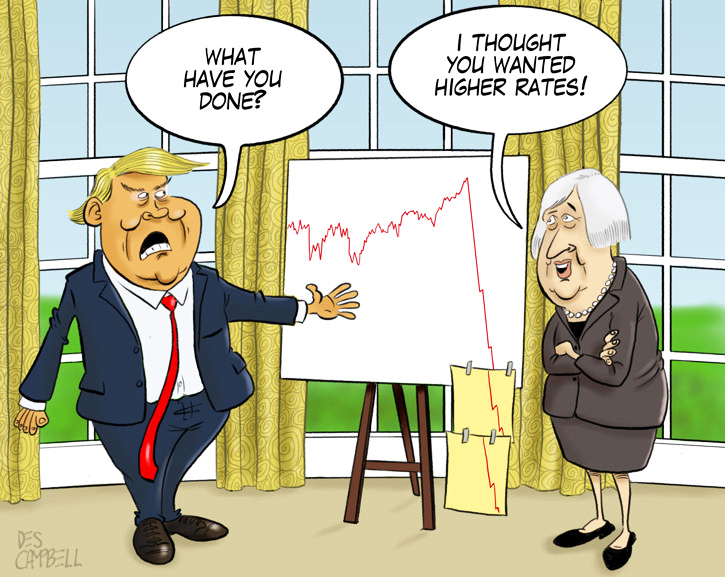 As economic laws reassert themselves, rising rates by themselves are not something to fear, as long as the pace is steady and expected. History shows stock market valuation expansion continues even with a backdrop of rising rates, as economic expansion remains on track. 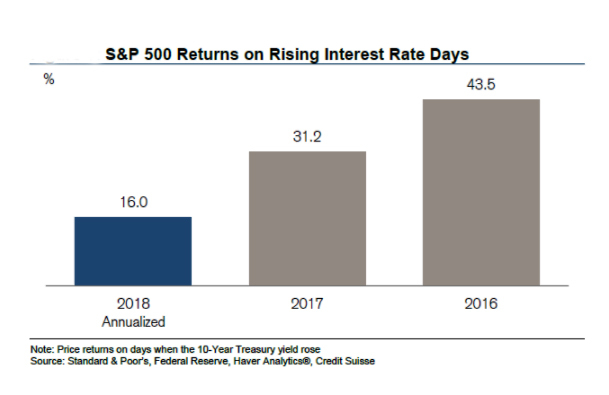 In an interesting analysis, Credit Suisse analysts looked at the impact of daily rises in interest rates and the stock market performance. As real interest rates become neutral, stocks will have to rely mostly on earnings growth and not as much on multiple growth anymore for expanding valuations. Rising rates adversely affect the discount rate used in earnings models, resulting in lower price targets for the same projected earnings. This can add volatility to the stocks but does not change the upward direction. Typically, earnings don't remain static and rise as well thus offsetting or mitigating the impact on stock price targets. There will also be volatility spikes from time-to-time when inflation data moves beyond the trendline, thus raising concern about aggressive Federal policy. In our viewpoint, inflation worries will prove to be a passing concern and not force the Federal Reserve's hands much beyond the projected number of rate hikes of 3 for 2018. Perhaps it may go to 4. The market adjusted swiftly to inflationary fears and rising yields with steep declines. Such sharp declines are typically accompanied with similarly sharp V-and W-shaped recoveries, as consolidation occurs. This is because the economy remains strong, and offers an earnings floor to stock valuations, thus arresting deeper declines into high-teens and 20% territory. The recent wilting of the stock market has to be seen through the lens of a business cycle. A return to a normal cycle would mean rising stocks in the expansion phase interspersed with periods of volatility and pullbacks. Over the past year, investors were spoilt by disappearing drawdowns. In fact, drawdowns in the market are more common than it appears and nearly two-thirds of the time a portfolio is in a Drawdown state, as discussed in Living In A Drawdown State. There will be heightened volatility but that does not mean an end to stock gains. As the consolidation phase ends, we will experience a typical cycle of ebb-and-flow with a clear uptrend, but no longer uninterrupted rallies. As long as the pace of interest rates rise is controlled and expected, and not forced by unexpected inflation, stocks will continue to accrue gains in this economic expansion. However, the consolidation has to run its course and exercising patience is prudent. The sharp rise in bond yields in the closing days of January was disconcerting enough to induce us to reduce the portfolio exposure to 75% for the Prudent Biotech Portfolio and 70% for the Graycell Small Cap portfolio at the end of January. As of the beginning of the month, the Prudent Biotech Portfolio was up +26% and the Graycell Small Cap was up +10%. We intend to recalibrate our portfolio exposure as the consolidation process works its way through and opportunities present themselves.